IS YOUR SOAP HURTING YOUR OTHER SKIN CARE PRODUCTS? WITHOUT EXFOLIATING SKIN, OTHER SKIN CARE PRODUCTS ARE LESS EFFECTIVE. That's because dead and damaged skin cells accumulate in a layer at the very top of skin. They cast an ashy, dull look to your skin and clog pores, which increases the likelihood of blemishes and breakouts. They also block the healthy skin cells underneath from fully absorbing your other skincare products, like moisturizer. The result is oily and clogged skin on top, while the healthy skin underneath starves for moisture and nutrition. The solution is an exfoliating soap designed to do triple duty. O'TENTIKA Premium Exfoliating Soap gently buffs away that top layer of dead skin cells, cleanses the healthy skin underneath, while healthy and aromatic apricot transforms ordinary skincare into a spa-like pleasure. So this exfoliating bar soap unveils and illuminates the radiant and healthy skin hiding underneath for a younger, fresher-looking you. Order this exfoliating soap today to both clean and restore youth to your skin. O'TENTIKA Premium Exfoliating Soap is formulated for gentle action. It works well for delicate facial skin but can also be used anywhere rough skin is experienced. Don't forget your neck and throat along with rough areas like elbows & knees. Follow up with O'Tentika Maxitone Complexion Milk, Premium C15 Serum and moisturizer as a comprehensive skin health regimen. Be aware that exfoliating skin can go too far: you only want to remove dead skin cells, not the healthy cells underneath. To determine how frequently to use the exfoliating bar soap, judge by your skin type. For dry skin: use once to twice a week. For normal to oily skin: use daily or every other day. 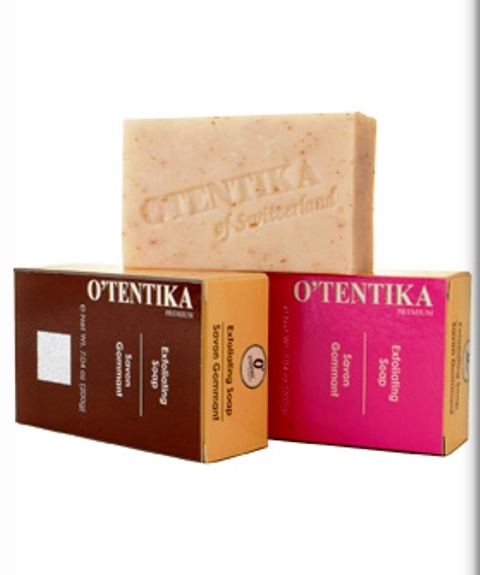 (The rest of the time use O'TENTIKA Hygienic Complexion Soap). If redness or irritation results, reduce the frequency of use, or discontinue. Like all similar beauty products, O'Tentika Premium Exfoliating Soap is intended for external use only. Avoid contact with the eyes. Do not use on children under the age of 12. Finally, be sure to brush your teeth, because you'll find yourself smiling more often at your brighter, luminous skin.